I updated the driver and now it will not connect to the company file. I'm getting error = 8004040a. It says that the company file is already open and is different from the one requested. I only have one company file. 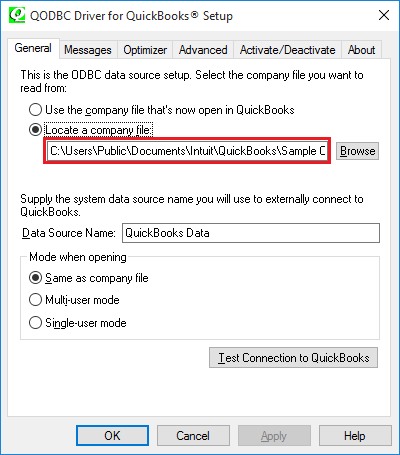 The error is saying that you have QODBC unattended mode setup as per "Locate a company file" as below, but QuickBooks is already running with a different company file open. You need to verify the company file path on QODBC and QuickBooks, these two paths should be the same. You can find QODBC company file path via QODBC setup screen -> General tab. Now it is able to connect to our file. Here's another problem. I used to run queries in Access. Now when I run my query, no new data shows up. All it has is the data that was put in when I did the link table the first time around. It used to update the tables. Try unlinking and relinking the Linked QODBC tables in MS Access. The QODBC Driver uses the QuickBooks SDK, which is limited to the features of the standard QuickBooks desktop product, which cannot open multiple company files. You must only open one company file at a time on a single machine. However, I have QuickBooks open to the file I am trying to connect to, and I am instructing the connection to that file. There is only the one file. Why am I getting this message?. 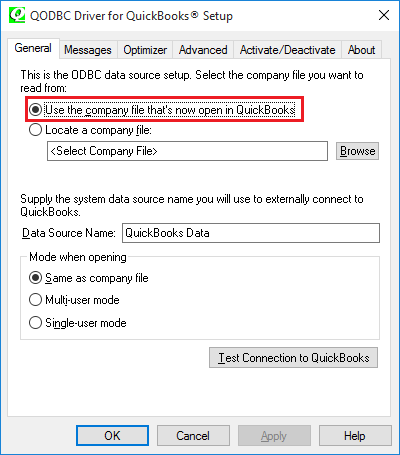 If QODBC is set up to "Use the company files that's now open in QuickBooks" as follows, then it works as expected. Then QuickBooks must not already have a company file open ........ Even if it's the same company file!!! QB Begin Session Failed. Error = 8004040a, A QuickBooks company data file is already open and it is different from the one requested. Try closing the company file and let QODBC open the company file. I'm using QODBC 13.0 and QBES 13.0. So does all this mean that I can only use QODBC one of two ways. I would like my Excel file to work whether Quickbooks is open or not. I can get it to work just fine with Quickbooks closed - the setup using a designated company file. In otherwords, Auto-login works just fine. But if I try to refresh the Excel worksheet with Quickbooks open, I get the error of "Begin Session Failed.Error = 8004040a, A Quickbooks company data file is already open and it is different from the one requested or there are multiple company files open." I've read the above replies and multiple FAQ answers that say multiple company files can't be open. So does that mean that I can't use QODBC populated Excel spreadsheet with Quickbooks already open.